Tiffany Wright never planned to become a torch singer, much less a pregnant and single one. It was only with the help of her Fat Fridays luncheon group of strong women - counting their blessings, not their calories - that she found the courage to leave Beau, her once wonderful husband destroyed by drug addiction. Now those same women are her supportive audience at Sassy Saturdays, the enchanting evenings when Tiffany belts out ballads at a local club. Things heat up when Kevin Bascombe - tall, dark, and exceedingly handsome - moves in next door...and turns out to be both Beau's new business partner and Tiffany's literal savior in a storm. And when tragedy strikes, Tiffany and Kevin find themselves on the same side of a legal battle, while Tiffany must summon the strength to stand up to her domineering in-laws or risk an unbearable loss. 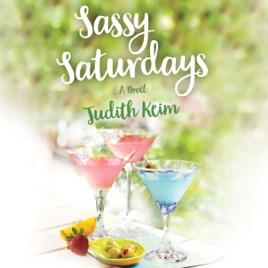 With blue martinis as their talisman, the Sassy Saturdays friends, each facing familial challenges of her own, unite in support, finding hope in friendship, sisterhood, laughter - and colorful cocktails.